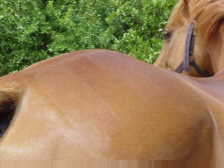 Quarter marks, when brushed onto a clean, shiny solid coloured (not grey) horse's hind quarters, can really 'finish off' a horse's 'look'. There are many different designs for quarter marks, but I've only ever tried two. Stencils can be bought from saddleries with have squares, diamonds or other shapes on them. 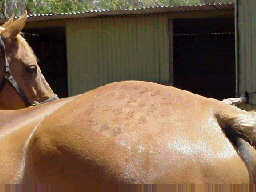 Use a damp sponge and wipe over your horse's quarters, then lay the stencil in the required position. It helps if you have someone else hold the stencil why you use a slightly damp body brush to brush against the growth of the hair. When the stencil is removed - viola! The photo on the left is not clear at all - this is what happens when you try using quarter makers on anything but a spotlessly clean horse! (Tisca was being used as a model, and we didn't have time to wash him first). Spray the marks with hair spray, but don't put a rug on them as they will rub off, so you should do the quarter marks at the show. To create a similar look to the stencil, a small section of comb can be used. This takes longer, but can be very effective in creating a checker-board pattern. Another method is to use a mane and tail comb (the ones that are around 10cm long) and draw perfectly straight wide lines (around three) on your horse's quarters, extended approx 20cm downwards from the middle of the hindquarters, on either side (see photo on right). Once again, the coat has to be clean and damp. To finish them off, brush with the normal lie of the hair across the bottom, or normally 'sharks teeth' are used which start where the stripes end. Sharks teeth are difficult to explain without a diagram - but one will be coming soon! Especially in the hack ring, face make up can be a very effective way of highlighting a pretty horse's head, and like human makeup, you can also use it to disguise your horse's not so pretty features. But make sure you don't over do it and have your horse ending up looking like a racoon!! For more information, there is a really fantastic article at Hoofs and Horns by Sandra Morphett, called Applying Make Up to Horses . What you do in the ring depends on the class you have entered. Below I have covered the events that I have entered this year, as they are the only ones I'm pretty sure about. After you have your horse off the float and settled, it is time to enter your events if you haven't had to do so earlier by mail. Find out what ring or arena your class is in, and make sure you are close to it when you class is about to start. Warm up as you would at home, don't try anything new as your horse is probably already excited, you don't want him confused as well. Don't warm up for hours on end either - an exhausted horse won't work well!! Once your horse is working calmly on the flat pop over the practise jump that will be set up. It should be marked with flags or something similar - ALWAYS remember that white is on the left, and red is on the right - you don't want any collisions!! Try and time your warm up so you don't have to stand around for ages before entering the ring. Make sure you get your gear checked with plenty of time to spare. Before you can enter the arena you must be gearchecked. The gearcheckers look over your bit, helmet, saddle and stirrup leathers mainly, and make sure everything is safe and allowable for that class. You will also have to walk your course. Unless you are running very very late, make sure you DO walk the course, as it is then that you can figure out the most direct routes, any tricky spots, and striding for related distances. Make sure you walk between the start and finish flags as well so you know exactly where they are. You should walk the course wearing what you plan to wear while jumping, including your helmet as well as your whip or spurs if you are using them. Once you have entered the arena walk or trot over to the judge and salute. He or she should check your number and mark it against your name on the schedule. They may even ask your name and your horse's. He will then ring the bell, and probably tell you that you have sixty seconds to begin your round. Most judges wish you luck as well. You then circle at a canter, or simply canter towards the start flags. Whatever you do, make sure you actually go between the flags, otherwise you will be eliminated. Same goes for the finish flags, people are eliminated for this error more often than you'd think. If during your round you knock a pole or jump so that the jump is disarranged, during a refusal, time will be stopped while someone comes and reassembles the jump. Wait until the bell rings again before attempting the jump again. When you have finished your round, trot or preferably walk out of the arena. Don't gallop out - it's not very courteous! If you have gone clear don't go too far away, the jump-off could be sooner than you think. 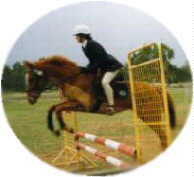 As with showjumping, you must be gearchecked before approaching the judge. Make sure you are aware what type of bits are allowed at the level you plan to compete at, and whether whips and/or spurs are allowed. As the competitor before you is leaving the arena at the end of their test you will be able to walk your horse over to the judge's car which will be parked at C. Tell the judge your name, as well as your horse's, or they may read your number. You then head for the other end of the arena, and the judge normally beeps their horn as you are heading in that direction, or while you are circling in preparation for entering at A. The horn means that you have one minute to enter the arena. At the conclusion of your test, even if it has gone dismally, do not get angry with your horse, but calmly leave the arena at a long rein walk. The judge is still watching you, and writing in the all important final comments and marks. One thing about dressage which can be a bit annoying is that it can take ages for the marks to be tallied and your results available. But what's great, is that no matter whether you win or come last, you have the judge's comments and opinions. And often these can be a lot more useful than a piece of blue satin or velvet!! The dressage and showjumping phases of eventing are very similar to that in 'straight' showjumping and dressage shows, however it is the cross country phase which often has the most influence on your final placing. Normally the cross country course is open the day before the event is to take place. Make sure you get a map of the course before you set off - these often tell you any alternate routes - and also prevent you from missing a jump. I walk the course at least twice the day before, and then once again on the day of the event (normally straight after the dressage, as the course shouldn't be closed yet). Look out for any land marks so that you don't go the wrong way, and watch out for dodgy footing or jumps where you may have to really push your horse. Decide at this stage which route you will take if a jump has options - while you are galloping towards it isn't normally the best time to make these decisions!! The clothing for cross country is very different to that for the other phases. Ties and jackets are not required, although at pony club (and I think EFA) level you need long sleeves. As I don't have proper 'silks', I actually wear my pony club uniform without the jumper, cross country, although I plan to get a proper shirt ASAP. You must wear an approved helmet, which can be covered in a brightly coloured silk to match your gear. People often also match their horse's boots, browbands (see instructions on ribboned browbands here ) and saddle blankets, and this can look really great. Although I don't wear a back protector (I've only done up to 2 foot) I'd definitely recommend wearing one. Gloves and rubber covered reins, or reins with stops give a better grip, and long boots are also good for cross country. If you horse wears boots or bandages they must be secured with electrical tape. I also have to wear a medical armband, which lists your name, age, doctor, medical history, allergies, vet etc etc. They are compulsory here, and if they are for the event you are competing at make sure you buy one. Although they are called armbands, a lot of people prefer to strap them to their boot leg. Once again, you must be gear checked before you start your round. When it is your turn you will go into the start box (a three sided box) and then the starter will count down from 5 or 10, and then you're off!! Some people get their horses really hyped up in the start box, but I personally wouldn't recommend it - after a few one day events your horse will know exactly what the start box means and you won't need to hype him up! If you are going to be over taken by a rider, get out of the way if possible. If your horse is repetitively refusing at a jump, and another rider is catching up, get out of the way, as the on coming rider has right of way. If you are eliminated the jump judge will ask you to leave the course, and do so immediately, at a walk. At the end of your round, make sure you go through the finish flags!! After doing that your first priority must be your horse. Get off, run up you stirrups and loosen your girth and then lead him around at a walk until his breathing has slowed down. After he has cooled down a bit you can offer him some water, and then hose him down. Don't give him water immediately after you finish your round. Cross Country is one of the best adrenalin rushes you can get, in my opinion, but it can be scary if something goes wrong, so make sure you are properly prepared before you enter an event. Hacking is judged on your horse's appearance, but also on how well he is going. If your horse looks beautiful, but is not well trained and has nice paces he won't do well in the hack ring. Before entering the ring make sure your horse and your clothing are absolutely spotless. You should have already applied face make up, quarter marks (if you're using them) and painted his hooves. Make sure your hair is very neat and your hunt cap on straight. Check that all straps are in their keepers and that everything is correctly organized. Remove any stray hairs from your numnah. When your class is called enter the arena walking in an anti clockwise direction. Judging doesn't begin until the judge says 'walk on please', so make sure that you're in a good position and not being crowded or are stuck behind anyone. When the judge asks everyone to walk, make sure your horse is correctly flexed on the bit and is walking forward freely. The judge will then ask all competitors to trot, and then canter. She may ask the class to change direction, she will do this by asking one rider to cross across the ring, and then everyone else will follow. She will then start calling horses in, either by calling your number (make sure you know it!) or by saying something like 'that bay with the stripe' or something similar. If you are called in line up to the left of whoever was called in before you, and don't let your horse rest a leg. When enough horses are called in (anything from four to the whole class) the judge will say 'Thankyou', or 'that's all thankyou' and if you haven't been called in you then leave the arena at a walk. The judge will now describe the workout to you. Repeat it back to the judge if you aren't sure about it. The rider who was called in first will perform the workout first, and then the person who was called in second and so on. It is during the workout that you have a chance to really show off your horse, so make sure you listen carefully and don't make the workout to small or too large (both common mistakes as the workout is normally done in an unenclosed area). When all competitors have completed their workout the judge will normally stand before you and pointing to each place getter, will say 'the bay first, that chestnut second, that bay third' or similar. If it is a rider class the ribbon is tied around your left arm, if is is a hack class it is tied around your horse's neck. When given your ribbon say, 'Thankyou' or 'Thankyou judge', and after all ribbons are awarded turn to the rider on either side of you and congratulate them. Some riders will say something like 'Thankyou judge, congratulations riders' after the ribbons are handed out. While the judge is awarding you your ribbon they may give you advice on what you did wrong, or right. This can be really helpful! Leave the arena with the winner leaving first, then second and third, and the non place getters leaving last.